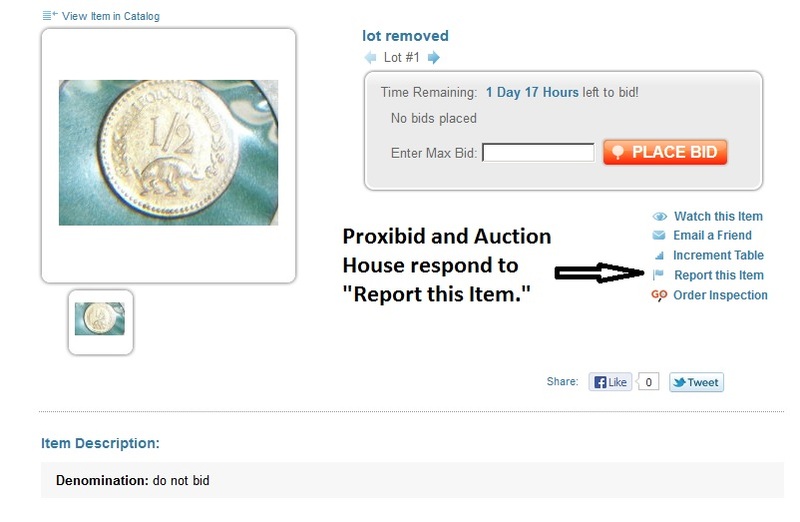 We were excited when Proxibid unveiled its “Report this Item” function. We’re more excited to see that the portal followed through on one of our reports of fake California fractional gold. Among the most faked coins are California fractional gold. Almost all being offered on Proxibid, eBay and other portals are base-metal replicas manufactured in the 20th century. Typically, they feature a bear on the reverse with “1/4” or “1/2” or “One”–eliminating the monetary denomination 25 cents, 50 cents, half dollar, dollar and so forth. 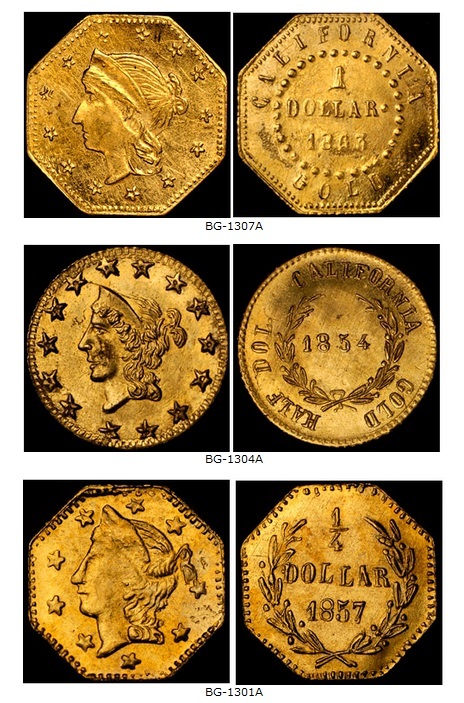 Below are examples of real California fractional gold, compliments of NGC, which also has posted an article about the kinds of coins it holders. Proxiblog has run several articles about California fractional gold. One of our posts is logging more than 100 views per week. This post challenges Proxibidders to use the “Report this Item” button whenever you discern a fake or replica example of California fractional gold. Do not label lots with the words “California,” “fractional,” “gold” or “coin” unless you or your consignor can identify the Breen-Gillio number as found on CoinFacts. Do not use the word “token” or “charm” unless those words appear in a slab by PCGS, NGC, ANACS or ICG. Unfortunately, many other slabbing companies cannot tell the difference between real and fake fractional gold. Test the lot for “gold” before using that word on any lot or you will be found in violation of the Unified User Agreement for not describing the fake accurately. Why are we taking such a stand? Because real fractional gold sells for hundreds and sometimes thousands of dollars, and we have seen certain bidders (ones that try buy all lots marked “gold” in any Proxibid coin auction) paying exorbitant fees for near worthless brass and/or gold-dipped brass plate. Beware the bear on the reverse. Learn about the hobby. Bid with confidence when you are confident about your knowledge of numismatics. This entry was posted in News, Uncategorized and tagged American Numismatic Association, Auctioneers, AuctionZip, Best Practices, california fake gold, california fractional gold, Coin Auction, iCollector, National Auctioneer Association, Proxibid, Proxiblog. Bookmark the permalink.